I am committed to helping my clients whether they are concerned for their own financial needs or those of their family or business. I don't do it alone. 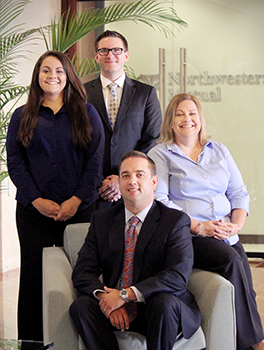 With the support of a dedicated staff, we stand committed to providing you the best client service possible. If you have a problem or need assistance at any time, please let us know. Kevin Clair, a Smithson Valley native, joined the team in May 2015 after graduating from UTSA with a bachelor’s degree in finance. Kevin is responsible for running insurance proposals and creating financial plans for clients. In his role he, communicates with clients to assist in the information gathering process in order to draft an accurate financial plan. Kevin enjoys hiking, the outdoors, attending concerts, trips to the coast with his extended family and discovering great places to eat with his girlfriend Andrea. He is a huge Green Bay Packer fan!